In the writers’ room, do you now refer to this character as “Mother” rather than Norma? Yes. She’s definitely not Norma; she’s a very specifically different character than Norma. She’s Mother. Is that actually Vera sitting there or did you create a statue of sorts? It is Vera a great deal of the time, yes. I’m telling you, Vera is the most fascinating actress on so many levels, including playing dead. She’s fascinating even when she’s dead and I don’t know how she does it. Was it important to have a Marion that stuck around for a few episodes rather than a one-off? Yeah, certainly as a woman it was appealing to me to try to tell the story of Marion Crane and give her a little more personal time. That’s a fascinating situation for a woman to be in, the one that she’s in in Psycho. Obviously Psycho is a different thing. It’s a different animal and brilliant and is built to work the way it works. It’s a lot about slight of hand, and the director wanting you to see certain things and not see other things. 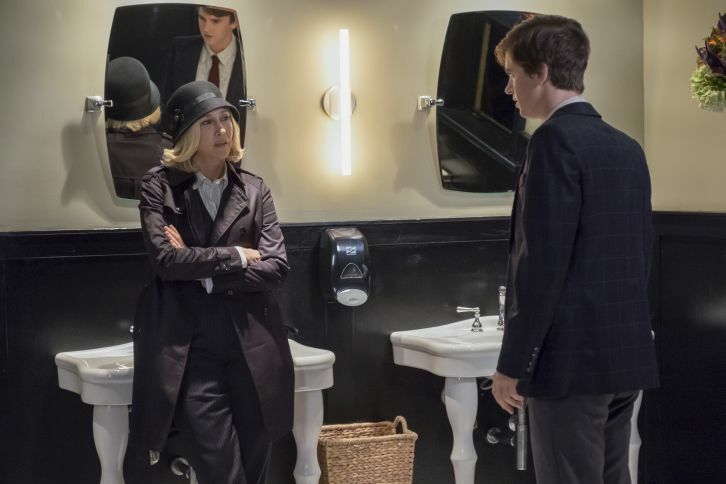 What’s cool about the compliment of Bates Motel to that is that Bates is very much about letting you look everywhere and anywhere. In Psycho, you never get to see what’s going on in the house. That’s all offstage. This is a little bit about taking Psycho and seeing what’s offscreen in Psycho and flushing it out and kind of giving a picture of the whole craziness of the world that Norman was living in. We imagined the relationship between him and Mother as a “bad marriage” — a marriage that had begun to show cracks. (If you use the example of being in a bad marriage — you could be in one — you go to work, talk about the great weekend you had together, and it all seems great from the outside. All the pieces are in place for “happiness.” But then there are those moments of clarity late at night when you know in your heart that you are isolated from each other and this isn’t going to work. But that’s too painful to think about so you put it away again and go back into the fantasy you’re selling yourself.) This was what we based the psychology on for Norman’s understanding of his situation. The fact that sometimes Norman can go in the freezer and see Norma in there, those are his moments of painful clarity. But he can also shove it away and walk away and go back to the denial in order to survive the pain.